Biography & Genealogy: Richard Brooke, Class of 1870: Genealogy: Born- ca. 1847 in Richmond, Va. Father- Robert J. Brooke; Mother- Elizabeth Ann Vaden. Pat. Grandfather- Richard Brooke; Pat. Grandmother- Selina D. Poe. Mat. Grandfather- Thomas Vaden; Mat. Grandmother- Eugenie Sallie. Married- Nannie Daniel of Richmond, Va. in 1874. Children- No information on whether or not there were any children. 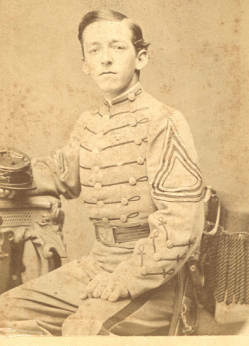 VMI Record: Entered VMI- Sept. 10, 1866; Graduated July 4, 1870 ranking 15th in a class of 52. Military Record: Served with the Richmond Howitzers during the Civil War. Careers: Assistant Professor of French at VMI in 1870; Assistant Professor of French and Tactics at VMI in 1872; Secretary of the Richmond & Danville Railroad from 1873 until his death. Died- May 19, 1892.